Hawaiian crescent fan or Peahi niu. This rare example is one of the few fans known to have survived. 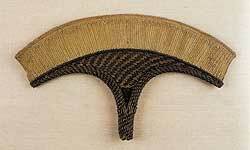 Woven of plaited pandanus interwoven with human hair. This art form surpasses anything in design and form in Polynesia and represents the highest achievement in the basketry arts. Reserved for people of high rank only, the crescent fan motif is encountered in traditional Hawaiian tattoo design. Width: 15 inches. 18th century. Collection of Mark and Carolyn Blackburn.